What do foot binding, women’s high heels, and bunions have in common? They are all the result of feet being cramped or bound in tight places for too long. Too much pressure puts stress on the toes. 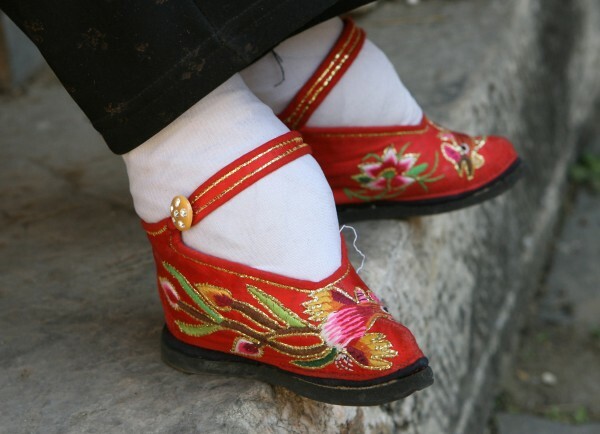 Foot binding in China goes back thousands of years. As early as 1700 BC, young Chinese girls would have their feet wrapped tightly with 10-foot long bindings. The goal was to crush or break their tender bones into a shape that, for whatever reason, was declared appealing and attractive by their culture. Foot binding was such a prevalent practice in China that marrying a woman who didn’t have deformed feet from this barbaric practice was unheard of. Those who failed to comply would be resigned to a life of hardship because they were looked upon as undesirable outcasts. Modern day society has women wearing shoes that effectively create almost the same disfigurement as the practice of foot binding in China. Foot binding was finally banned for the first time in 1912, mankind hardly skipped a beat before it took up the call of disfigurement for the cause of beauty. Stiletto heels first came on the market around 1930. Sticking young girls’ feet into high heels is becoming a dangerous trend because it’s during their youthful years that bones grow and form the shape that will carry them through the rest of their lives. Bunions are a painful result that is sometimes attributed to wearing shoes that compromise the natural space requirements of your toes. Bunions can largely be aggravated by the pointed shape of most high heel shoes. The young professional working woman has little choice in today’s society as to style of appropriate footwear. With the majority of shoes being of the high heel variety, the potential for foot problems later in life is almost guaranteed. I can’t help but think the unusually high arch and odd shape of my wife’s feet are at least partially the result of spending a working lifetime with her toes confined in shoes that are not only hard to walk in, but overall damaging to the basic structure of her foot. 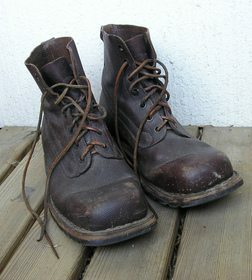 As a construction worker, I spent a good portion of my work life wearing steel toed boots. With these tall boots laced snuggly above my ankle, I was offered much more protection from falling objects courtesy of the steel reinforced toe. I was also provided with proper arch support, additional ankle support, and plenty of room to move my toes around. Though not all that stylish now, some 30 years later, my feet look as good as they did in my youth after a hard life of outdoor activity and cold weather. If women’s work shoes were geared more toward the practicality of men’s construction shoes, maybe a few podiatrists would be forced out of business. There is one problem with this theory though, finding that open-minded man that is attracted to a set of long slender legs running all the way down to a set of steel toed boots might be a bit difficult. As stated at the beginning, it’s all about a preconceived idea of beauty.